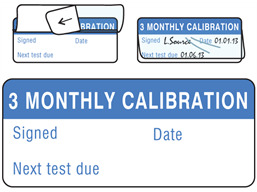 3 monthly calibration labels. Write and seal, self laminating labels. Size 16mm x 38mm. Rub test compliant. Material self adhesive vinyl, with part attached clear vinyl laminate. Supplied in rolls of 500 labels. LL10025 Size 16mm x 38mm Material self adhesive vinyl (print receptive) with part attached clear vinyl laminate.